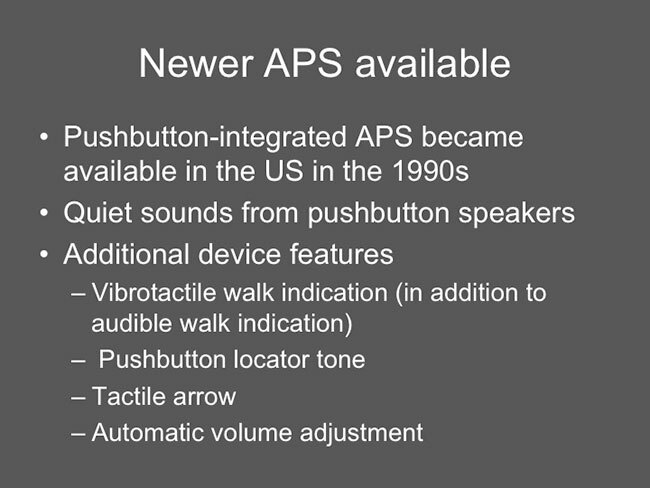 New types of APS, called pushbutton-integrated APS, became available in the US in the 1990’s. These are like the APS that have been installed for years in Europe and Australia and provide quieter sounds from speakers located at the pushbutton rather than from overhead speakers. They also provide a vibrotactile walk indication (in addition to audible walk indication), have a pushbutton locator tone, a tactile arrow, and automatic volume adjustment. We will talk later in detail about these various features.